"White Wig: Entering the Green Room" (2016) 30"/30" acrylic paint, pastel, shellac on canvas. BAYarts kicks off the new year with an opening reception for its latest exhibitions from 7 to 9 p.m. on Friday, Jan. 6. These new exhibitions include John W. Carlson and Douglas Max Utter’s Between Presence and Projection, presented in collaboration with Hedge Gallery at 78th Street Studios, which represents both artists’ work. 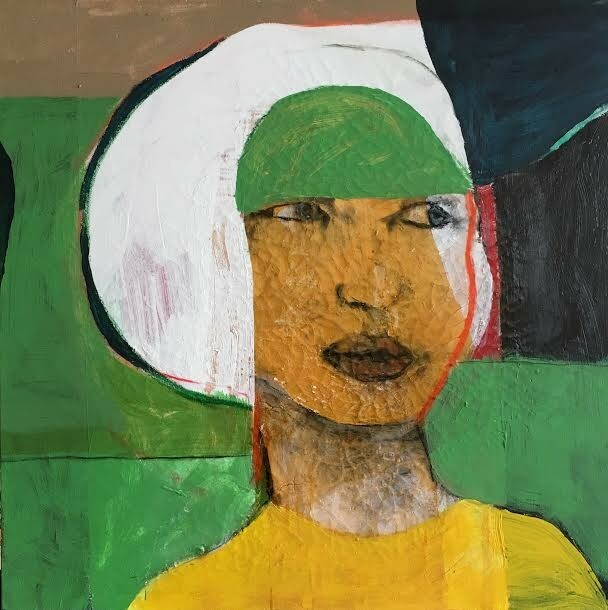 Both established local painters, Carlson and Utter exhibited together in several group shows in 2016, including Face Value at Hedge Gallery and BAYarts 10: 10 Artists, 10 Years, both in July. Both artists have a long history with BAYarts, including participating in several individual and group exhibitions. Between Presence and Projection was a longtime goal of BAYarts’ Artistic Director Karen Petkovic. Carlson was born in Ashtabula, and attended Cleveland’s Cooper School of Art. His recent exhibitions have included collaborative exhibitions with Shari Wilkins, founder of the Cleveland Print Room. The first of these Destruction of Form exhibitions traveled to BAYarts in February 2016. Since winning the Best Painting Award in 1987’s May Show at the Cleveland Museum of Art, Utter has received a 2013 Lifetime Achievement Award for Visual Arts from the Cleveland Arts Prize, three individual fellowships from the Ohio Arts Council, a 2011 Creative Workforce Fellowship, as well as journalism awards from the Cleveland Press Club and others. His paintings have been exhibited in more than 40 solo shows in Cleveland, New York, Phoenix and Germany. Additionally, he has published several hundred articles, reviews and essays for publications such as Cleveland Scene Magazine, the Plain Dealer, CAN Journal, Kent State University Press, MOCA Cleveland, the Sculpture Center, William Busta Gallery and many others. Between Presence and Projection exhibition remains on view through Jan. 28.